Trio Classic Round Diamond Engagement Ring | Shane Co. Elegant, vintage-inspired swirl detailing is beautifully displayed on the profiles of this lovely engagement ring. 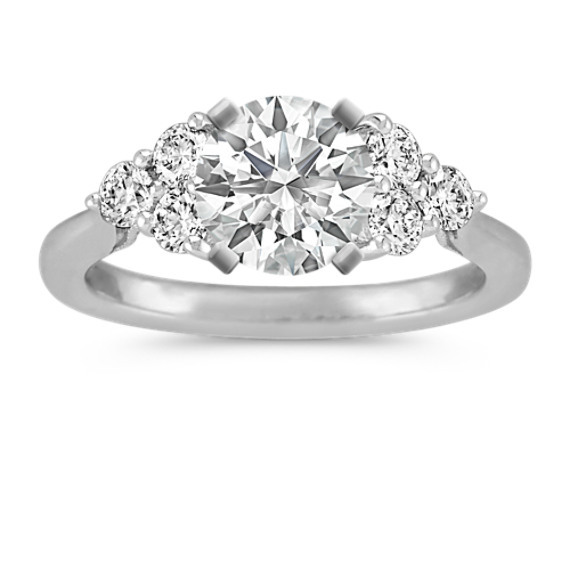 Your chosen center diamond will be accented by a trio of diamonds on either side of this classic look. Six round diamonds, at approximately .47 carat total weight, have been hand-selected for superior brilliance and dazzle in this setting crafted of quality 14 karat white gold. My fiance did such a great job picking this ring for me. I get compliments quite often from strangers. I will say, the ring sticks up pretty high off my finger so it's gotten caught on things a few times. The thing I'm dealing with currently is trying to find a wedding band that matches this ring and doesn't compete with it. If anyone has any suggestions, I'd love to hear them.